*Exclusive* Wali Faqih Sayyed Ali Khamenei surrounded by religious & national leaders after his address on the 4th international conference for palestine resistance and liberation. The conference took place on 05 March 09. Rahber e Muazzim, Wali Amr Muslimeen e Jahan, Ayatollah Sayyed Ali Khemenei (H.A) condemned israel\'s attack on the peaceful convoy taking the humanitarian good into Gaza Palestine. At least 20 innocents were killed by the Zionist commandos. Around 500 innocents have been detained. Rahber e Muazzim, Wali Amr Muslimeen e Jahan, Ayatollah Sayyed Ali Khemenei (H.A) condemned israel\\\'s attack on the peaceful convoy taking the humanitarian good into Gaza Palestine. At least 20 innocents were killed by the Zionist commandos. Around 500 innocents have been detained. What a kind leader he is. A true leader. A true Wali. Following the footsteps of Prophet (s) and Imams (a.s). 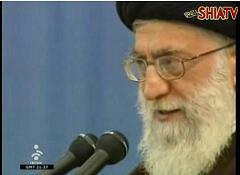 Allah has blessed us with a "Pidar e Shafiq" during the occultation of Imam of our time (a.t.f.s). O our Master, O Imam Mahdi, O our Mawla, please reappear and take charge of the "umoor" of Muslimeen.